The perfect umbrella for water parks, fast food restaurants or beach café, this umbrella features a playful wave design that will add a fun flare to any environment. 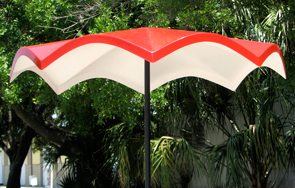 Umbrellas are constructed with solid fiberglass, and poles are powder-coated to prevent rust and corrosion. Standard umbrella poles are tested to withstand winds up to 50mph or you can opt for the High Wind Upgrade for umbrellas that withstand winds up to 70mph. 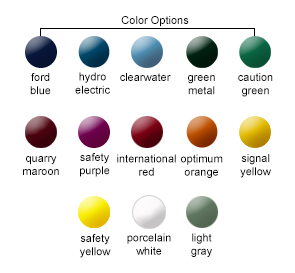 Choose from a wide range of long-lasting, vibrant colors achieved with a commercial grade two-part (catalyzed) polyurethane paint process, guaranteed not to crack, fade or peel. Umbrellas come standard with your choice of 6' or 8' pole lengths, in either white or black. Replacement umbrella poles are available. Pair with the matching fiberglass round picnic table shown.